Blended drinks aren't often bucketed into the craft cocktail category. Perhaps that's because the term "blended" makes many of us think of candy-sweet classics like hurricane slushies, strawberry daiquiris, and piña coladas. 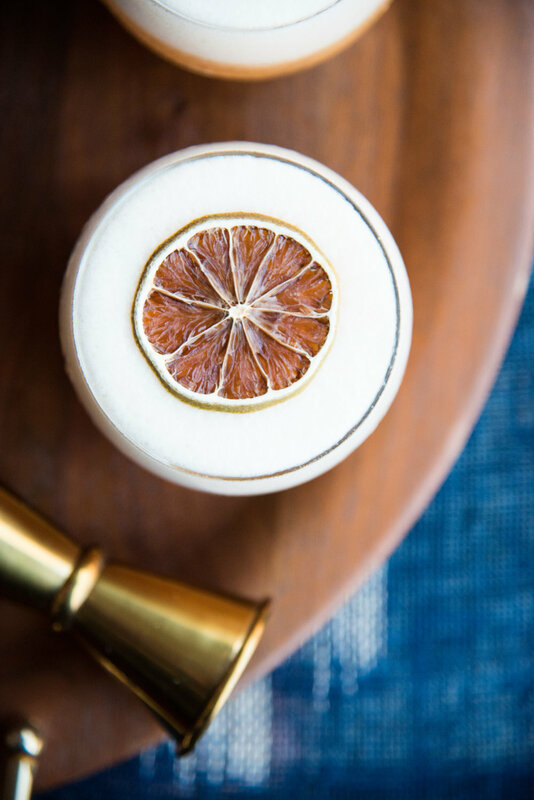 I've been happy to see cocktail bars in Chicago and throughout the country challenging that stereotype by creating blended drinks with more depth and quality of ingredients. It seemed like a great idea to join the movement myself. Allow you to get away with using thicker textures, thus retaining more ingredient flavor. I chose to stay with rum for the spirit since it tends to be the go-to for so many tropical, blended beverages. 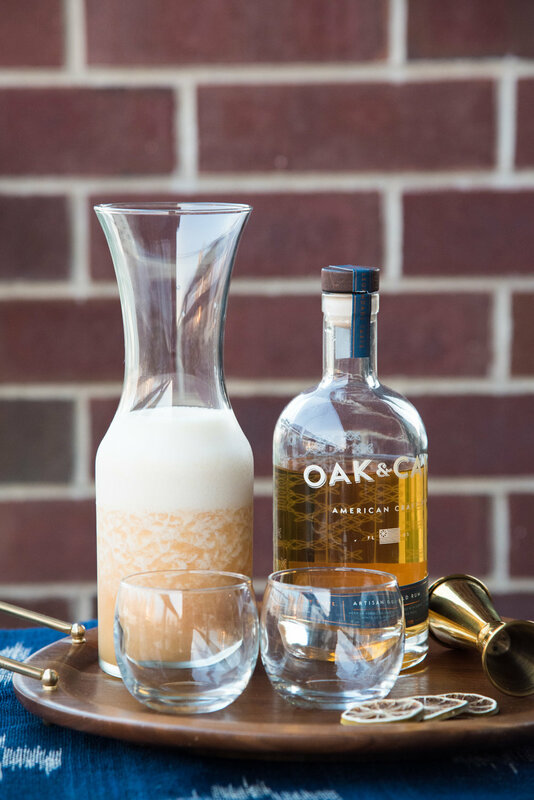 Instead of using white rum, I featured Oak and Cane, an aged rum infused with orange peel, for more weight and character. I wanted the rum to add interest to the drink rather than simply getting lost amid the fruit flavors and this one certainly delivered. 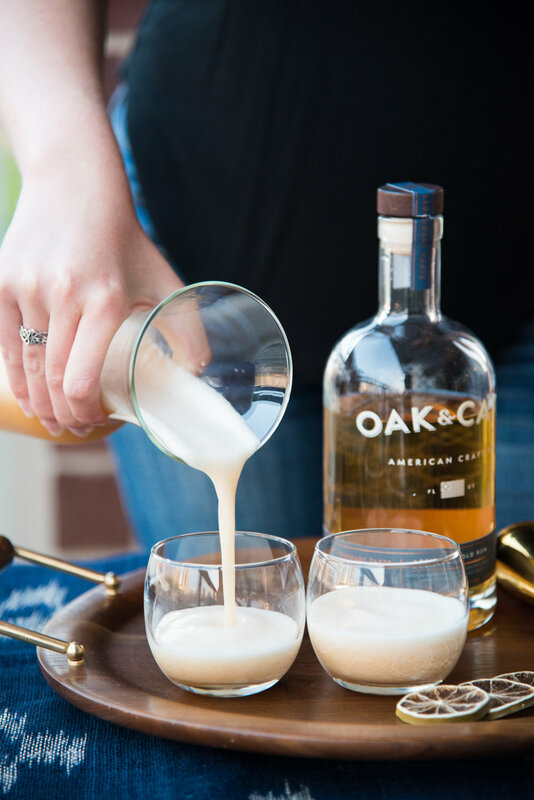 The cool (and rare) thing about Oak and Cane is that it's made in Florida of entirely American ingredients (Florida grown sugarcane and orange peels and American white oak barrels for aging). Its flavor profile is both woodsy and lightly bitter from the citrus yet delightfully smooth at 80 proof. For the fruit components, I used chunks of ripe pineapple, homemade peach puree, and freshly squeezed lime juice. It's true that incorporating the fruit in these forms takes more work, but it makes a world of difference in the finished product. Though pineapple juice can be an alternative if you can't find fresh pineapple, the flavor will be more muted and syrupy rather than vibrantly sweet/tart. I've also tried several different peach liqueurs but nothing ever came close to the fragrant sweetness of freshly made peach puree. That being said, ripe pineapples and peaches aren't always available so, if you really find that you love this drink, consider pureeing and freezing the fruit for future use. 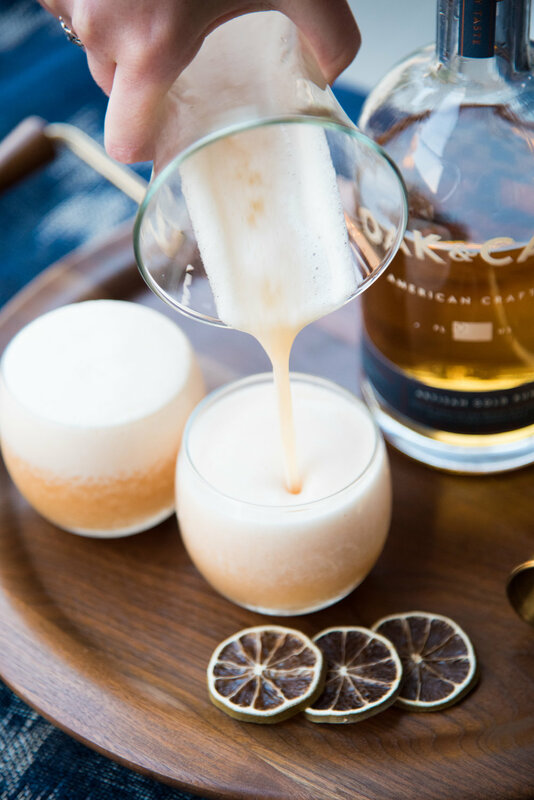 Blending these ingredients with ice resulted in an absolutely beautiful (and ridiculously delicious) foam. The cocktail will separate after you pour it into the glasses and all of the froth will rise to the top. I garnished the drinks with dehydrated lime slices as they have a lovely scent and are a little bit lighter than fresh slices for sitting on top of foam. You can check out an earlier post for instructions on making dehydrated citrus at home. The resulting drink has a delightfully creamy texture and fresh fruit brightness intermingled with the woodsy depth of the rum. Add all ingredients other than dehydrated lime to a blender along with 4-5 ice cubes and blend on a medium/high speed until the texture is consistent and frothy. Pour into stemless glasses and top with the dehydrated lime. Enjoy whenever you need some extra sunshine in your life. Thanks to Belen Aquino for the stunning cocktail photography and to Gather Vintage Tablescapes for the lovely MCM tray and glasses. After taking some time to travel the world for our belated honeymoon, I’m back to share some exciting summer entertaining cocktails with you. Conveniently, you’ll have these recipes just in time to create an unforgettable 4th of July party! For us, summer is all about spending time outdoors with friends and enjoying the fresh flavors and availability of seasonal fruit and herbs. It helps to have a rooftop garden with over 10 different herbs just a few steps away! If you enjoy herbal flavors in your cocktails, growing herbs is a much more cost-effective way to satisfy your palette. Don’t have a green thumb? In my experience, mint is the heartiest and easiest to maintain! It's a great first step to creating your own self-replenishing herb garden. My first recipe in the summer entertaining series incorporates an herb that’s as beautiful as it is fragrant – lavender. I’ve found lavender to be a great cocktail addition in syrup form and wanted to test out pairing it with a fresh summer fruit as a next step. Peaches came to mind as I thought the natural syrupy sweetness would be nicely offset with some herbal freshness. I’ve learned through multiple iterations of this cocktail that the flavor profile is heavily driven by the ripeness of the peaches. Less ripe peaches will yield a more herbal result while more ripe peaches will create a fruit-forward cocktail. You can try to pick ones out based on smell and firmness but it’s hard to be sure until you bite in (which can be an awkward testing approach at the grocery store). I started this cocktail by creating a peach, lavender and brown sugar syrup. While simple syrup recipes typically call for a 1:1 ratio of liquid to sugar, this syrup gets most of its sweetness from the peaches. The touch of brown sugar just rounds it off with a nice, caramel flavor. 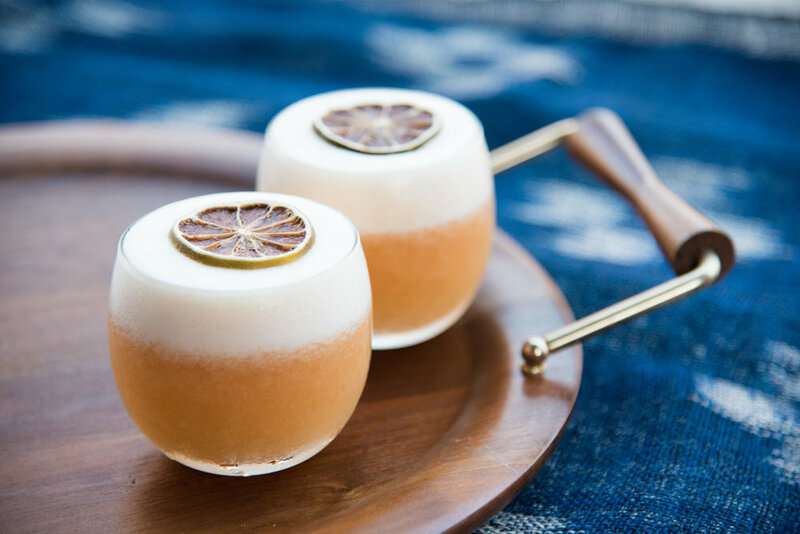 This recipe is a spin on a whiskey sour but the syrup is also fantastic with sparkling wine or vodka. I suggest making it in bulk and keeping it on hand for future concoctions. I wanted something tart, yet refreshing and easy to make in bulk. Cold brewed tea is always a great mixer for that purpose as you typically have everything you need to make it on hand and it tames otherwise boozy cocktails without watering down the flavor profile. The resulting mix of peach, lavender, tea, bourbon and lemon is a wonderfully peachy, slightly herbal, refreshing whiskey sour. If making 1-4 drinks, mix all ingredients in a shaker, shake with ice and strain into a rocks glass over a large ice cube. If making in bulk, adjust recipe for the desired number of servings and mix in a large pitcher. Serve over ice while frolicking under glorious summer sunset. * To create peach lavender syrup, cut up 8 small peaches and place in a medium pot with 1/3 cup of brown sugar and 3 cups water. Bring to a boil and stir occasionally. It will take about half an hour for the peaches to start to break apart when you press on them with a spoon. At that point, add a heaping tablespoon of dried lavender and boil for about 5 more minutes. Strain the syrup by pouring through a fine mesh strainer and pressing down on the peach mash with a large mixing spoon to extract all of the liquid. You can bottle up what you don't use and store in the fridge for around 2 weeks. ** To make cold brewed black tea, follow a ratio of roughly 1 tea bag to 8 oz room temperature water. Allow to steep for 30-40 minutes. Cold brewed tea can also be stored in the fridge for future use. 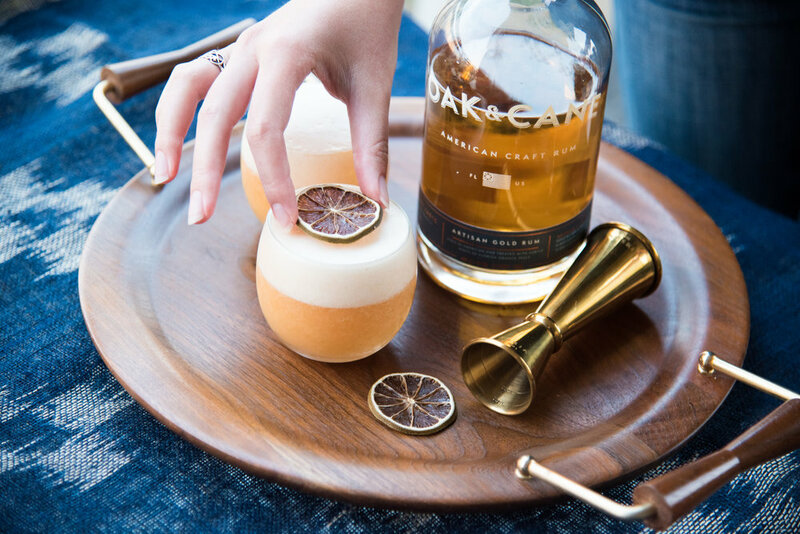 A huge shoutout to Belen Aquino for the stunning cocktail photography and to Gather Vintage Tablescapes for the inspiring glassware.